Every springtime flower is a surprise. An even bigger surprise? Enlighenment! Enlightenment could be your destiny! When it comes, will Enlightenment surprise you? Blog-Buddies, are you loving this spring? Gardeners like me nearly drool with delight. In the spirit of springtime, I’d like to share some of the latest statistics and facts about the fun world of energetic literacy and Rosetree Energy Spirituality. And here’s another milestone. Such a surprise! This surprise I know about. 🙂 There could be others I don’t know about, other Blog-Buddies who have achieved self-actualization. But the first student I do know about has crossed over that magical line from regular human to spiritual Enlightenment. I’ll say no more about GLADYS, to protect her privacy. My heartfelt congratulations are extended, not that she needs anything from me (or anyone else) to feel happy ever again for the rest of this life. GLADYS has bigger fish to fry now, although still apparently just a human woman. A woman who still doesn’t even have her own reality show, imagine! GLADYS has been a long-time seeker, so many others helped her make this shift in consciousness. However, she definitely did many sessions and many workshops with Energy Spirituality. Not just surprised. I am so very thrilled, as I have my eye on a number of clients and students who may soon be following her lead. Many of you Blog-Buddies, for instance. You are, to my perception, very close to Enlightenment — closer than many who have been proposed for the Enlightenment Life List. Well, GLADYS has made it. One of millions of people living now, in this Age of Awakening. Many millions of us will, I predict, move into Enlightenment. And we’ll do it as householders. May those glorious surprises accumulate quickly! I hope you’ll keep that session appointment, JILL. There are loads of things we could do, including my pulling out an energetic hologram of you at any time in your life. That could include comparing your aura at different times. For instance, what about reading you when you suspect that you slipped into Enlightenment, researching loads of your chakra databanks that you’re curious about. Then we could research you right before to get contrast. Etc.! Whether researching or healing, or discussing — ahem, development within Enlightenment (Stay tuned on that upcoming topic, Blog-Buddies) you just know it will be be interesting. Speaking of interesting, thank you so much, JILL, for these fascinating and brave and honest comments that you have been sharing with your humble teacher and this entire Online Community. Rose, I wouldn’t miss that appointment for the world. I am ecstatic that you are going to pursue the subject of development within enlightenment. I feel that is a subject that has not been touched on enough. In fact, I feel as you and Julie do that many many more of us are headed into enlightenment at this time – as householders – and there is precious little out there by way of support or information about what that means. I feel that I am a newbie and that I still have a long way to develop while, at the same time, feeling so very stablely happy, an equanimity, and trust that is the basis of this new developmental stage. It would be wonderful to know a little of what to expect from here on. So many and for so long have seen enlightenment as the goal. I am now seeing it only as another beginning. Thank you, Rose, again, for who you are and what you do. You are setting a new frontier for us – again. I know that it was the healing work of cutting cords of attachment and learning how to be a skilled empath that have made all this development possible for me. Jill, thank you for sharing your sweet and inspiring story. And congrats!! I think it’s so funny that you say you’ve been after Enlightment all your life, and now describe it as a “no big deal thing.” Funny funny funny. Through one side of the prism, it’s like life is one big ironic joke!!! I just visited your web site and read all your celebrity aura readings and they are fantastic! I am so happy that you are offering your services in this way. I took the workshops on aura reading with you, given by Rose, and I remember that you seemed to have a real talent for this. I also love the personal growth in you that this represents! Congratulations on all fronts! I can speak only for myself on this, but, it really is so natural feeling and everything is just the same. I “chop wood and carry water” just as I always have but everything is infused with a constant joy and lightness. Julie and Jeffery Chappell express it much better than I do. I look forward to hearing more from Julie. This feels like the beginning of something big. Those dominoes are going to begin to fall! Well said (and generously said), JILL. Last night I went onto the Enlightenment Life List and added you as #136. Incidentally, JULIE is there as #134. It’s easy to miss her as the listing isn’t highlighted as a link. So far I do not have a public photograph of JULIE. It will be up to her whether or not she wants to make her picture available. Trust me on this. She is lovely. Funny thing about that humility expressed by JILL in Comment 106. That IS a common denominator among Enlightened people I have known. Of course, humble people are usually the last ones to give themselves credit. And, of course, there is no outward behavior — even humility — that shows Enlightenment for sure. Congratulations Jill! How wonderful! I loved reading your posts and was especially interested to hear how your relationship with your husband is wonderful even though he does not share your interest in spiritual development. That was something I was curious about–relationships post-enlightenment. I suspected and you seem to confirm, that to an enlightened person it does not matter that everyone else is not on the same level. Anyway, I look forward to hearing more from both you and Julie about what it is like for you having crossed that invisible line. More wonderful news here…congratulations Jill! Got a lot out of your comments -thank you for sharing. What a great expansion of this blog. Thanks Rose for all you do – and congratulations to you as well. Personally I sure do appreciate learning of all this – am having a challenging holiday time – to read about all of this sure picked me right up. one hand – with way mo’ better great positive happenings on the other hand. With these thoughts in mind I will go out into the world today much cheered – thanks to all of this. Small technical point. At this blog (unlike Facebook and other places) we have POSTS and COMMENTS. POSTS are articles that begin on the HOME page of the blog. When you click into a POST and read the whole post, you come to the COMMENTS section. JILL, so far you have done amazing and wonderful COMMENTS. But, like SUZANNE, I don’t think you have done any POSTS yet. To contribute a post, just send it as a really long COMMENT. I’ll email you for permission to turn it into a POST, if I find it suitable. Or email a proposed POST to me at rose.at.rose-rosetree.com. If you plan to include a photo, for it to be suitable for the blog it cannot be a photo album but needs to suitable for downloading onto Photobucket.com. Hope all this is helpful, because I would love to see more POSTS from Blog-Buddies. One of my dreams for this blog is to have it mostly consist of aura reading posts, face reading posts, and skilled empath merge posts by you Blog-Buddies. Congratulations Julie and Jill on your accomplishments! After more thought on what you commented about my saying enlightenment, after a lifetime of seeking, is no big deal, I wanted to express that better. What that means is that enlightenment has nothing to do with the ego or personality. It is, as Julie expressed so very well, being so grounded in your Godness that everything circles around that. You are still, and observe everything in the world swirling around you and you know you can reach out and touch, but cannot be touched by any of it. There is ACT and BEING. Act is motivated by your Beingness and it is Bliss. Because your true Beingness is God, when you are grounded in that, your actions become right action born of only love and compassion. You actions may still be interpreted differently by anyone still not aware of their true Beingness, and that is where ego and personality come into the picture and can muddle it up. But, I have such a deep trust in the connection we all have within our true Beingness that I don’t even worry about that. I would sometimes feel a jolt of shock at some spontaneous thing I would do or say from my ego recognition that that didn’t come from my ego, but it always turned out to be appropriate and appreciated. Enlightenment is just a feeling of being Home. I know that there is going to be a lot of curiosity about what everything about my life is like before and after. I had the same curiosity and devoured everything Jeffery Chappell wrote here and in his book and felt sort of disappointed that he didn’t share more about that than he did. That was part of my motivation for sharing what I did. I plan to be very open and honest and willing to share anything you all are curious about. I have shared what is going on on this Blog with Warren and he is totally OK with me sharing it all. He trusts me. I think it is important for me to share about our relationship because I think the important point for everyone to understand is that nothing outside of you is responsible for you and who you are. Only we, each of us, is responsible for our life and our own happiness. That is what Rose teaches above all else, self authority and responsibility. She is so right to repeat that mantra over and over again. You are welcome. I was very shy about sharing a lot of that but I know how curious I always of of anyone becoming enlightened and I want to share so all of you can learn what you want and need to assist you on your own journey. Exciting and interesting times, indeed! Interesting observation. Especially given that I legally changed my name last year, with Rose’s assistance and a Soul Thrill session. Julie asked me to give everyone a message–she injured her wrist in a horseback riding fall this week and can only type one handed for the next few weeks. It is the left wrist at least, and she is doing fine. She wanted me to say that she is happy for Jill and thanks for all the nice comments and that although she can’t type much she is enjoying reading the blog and very happy to see how everything is evolving. We talked about how enlightenment is a different state of consciousness, not a guaranteer of only good things happening in life! Although I will say that she sounds remarkably good for someone who just broke her wrist. Jill, thank you so much for your reply. Even if I did twist your words a bit to make my point in my earlier comment, I can’t regret it when it elicited such a beautiful comment from you! You are truly a master, and how incredible is it that so many of us are aiming for the same thing, and believing it’s a realistic achievement for this lifetime. I really love what you said about sharing certain things here because you had been disappointed in the past when you wanted more or different information about Enlightenment. That is something I have thought about personally, and hoped that the humbleness of being Enlightened isn’t so strong that it wipes out my desire to share, since I love learning about it so much as a pre-Enlightenment person, and I’d like to do the same for others when I get the chance. Personally one of the things I hope I don’t forget is to make the distinction between qualities of Enlightenment and techniques for getting there. I mixed them up so many times, and see sincere people do it all the time. That’s how lovely things like non-judgment get a bad name, and people walk around trying to be detached from everything or think about God constantly. Many Enlightened people seem to forget to make the distinction between how they are and what made them that way, though you and Julie are doing a fantastic job at that, I must say!!! So well said. With special thanks to JILL and JULIE for your irrepressible generosity. Take good care of that wrist. Another lesson opportunity about what enlightenment is and what it isn’t! What fun this is because I now feel that we are sisters in this adventure. I am a fairly shy person when it comes to talking about myself, but I love to help others and share whatever I feel may be helpful. Your comment about retreating from the blog for awhile touched me for that reason. This may sound perverse to some, but I know you understand; enjoy the new opportunity of integration and learning! Love to you. Thanks Suzanne for sharing about Julie – best of wishes Julie for a speedy healing. – seems that in a certain sense we are all kinda doing this together…. …I also love teamwork…gooooo team! Thank you Jill! I’m so glad you enjoyed the aura readings on my website. I’m so enjoying this thread. Thank you everyone. Congratulations, JILL!! I have appreciated your recent comments very much and am so happy you’re willing to share your experiences. I also love that you changed your name! I wanted to share a tale that unfolded out of the inspiration of our enlightened Blog Buddies revealing themselves and sharing that going after Soul Thrill was a big part of the path for them. I mentioned elsewhere that my AHA! was to use my Soul Thrill research skills more often, especially with everyday stuff. Well, after feeling frustrated with the most recent haircut that the woman I’ve gone to for several years gave me, as well as wanting to spend less money on haircuts, the light bulb went on. I did Soul Thrill research on returning to her…flatline. Did research on a friend’s stylist, who happens to work half a block away from me and who charges considerably less. Big Soul Thrill! So I booked an appointment. Maybe other female Blog Buddies can relate to the nervousness of trying out a new hairdresser…well, when I got there, I was nervous. But it turned out great! I’m so happy I have this skill. And grateful to have been reminded by Julie and Jill that I can use it much more often than I had been. One thing I love about Soul Thrill research is how seemingly innocuous or mundane choices can have a big impact in ways I wouldn’t have expected. Congratulations Valerie and of course Rose as your glowing mentor! And Julie, congratulations on such a wonderful, momentuous step in your life! In my healing journey of the last year, I have changed enormously in my trust of people. Makes me wonder, JILL, if there is anything you would feel comfortable sharing about your trust of people and how it has developed. I mean spontaneous trust, mind you. Not how you handled people once they were in relationships with you, saying and doing whatever. I’m curious about your showing up as yourself, daring to be with them as they show up. Know what I mean? Very good question. The trust issue is huge for me…. A new client and student has moved onto the Enlightenment Life List, Pantelis Levantis, a healer from New York. Okay, one more person to add to the Enlightenment Life List. Me. I received an invitation, and accepted it, on July 14. Won’t officially put myself on the more popular blog post until a current photo is available. Haven’t taken any postable pictures since then. Yes, I’ll be writing about this at the blog, along with other aspects of Deeper Perception, aura reading, Skilled Empath training, Energy Spirituality healing, etc. But it didn’t feel honest to hide such a shift when it does inform my blog comments, and everything else. Oh, this is so great. I’m so happy for you, Rose! Such wonderful news here….I must admit I am a bit misty as I type. Am wishing for greater word-ish eloquence to better express my joy upon hearing this … will leave such things to others who may be more ideally suited in the eloquence department. So I will simply say – I feel so happy for you – and for all of us. After everything you’ve done to help others get there, I’m so happy to know you are there too. Congratulations Rose! I’m so happy for you. Congratulations, Rose! That’s such great news! Coincidentally, that was my wedding day. A happy day all around! And if only sweating could bring enlightenment, I would have been there, too. It was one hot and humid day in the northeast. Wow, Rose, I’m so happy for you! Congratulations, Rose! I am so happy for you! Also can’t wait to see that new book when it’s published. Lucky us! Oh Rose, I am so happy for you! Hurray Rose! This lifted my heart! Wow, Rose! Big congratulations to you from across the pond! Good job, Rose! and LOL, Amy. I’m so glad that’s my quote. I got the feeling, whether accurate or not, that Rose wanted to downplay expectations at that time. But look what happened! 🙂 So I stand by my previous comment! Oh Rose, this is truly fabulous news. And my smile for you is extra big because coincidentally, that day is my birthday. Your enlightenment is a gift for all of us! Can’t wait to hear your story. Hi Rose, I wanted to add an extra “congrats!” and… I can’t resist, ask a question. (Maybe you can address it when you decide to write about Enlightenment if you think the answer is interesting… or not.) Did you ever receive an invitation and not accept? Dear JORDAN, I didn’t purposely ignore your question. Sorry for the delay in responding. The invitation I received and accepted was the first one, I assure you. I moved into a gentle “Orientation Phase” of Enlightenment. By contast, JEFFREY CHAPPELL took some time over his invitation, as I think he described in “Answers from Silence” and his flavor of Enlightenment as a householder is probably more intense than mine. I assure you, JORDAN and other Blog-Buddies, there is a great deal to learn on the topic of Enlightenment, all the way from when and how it starts to what it is like, how it develops, for each individual. One more member of the Deeper Perception Made Practical Community has moved into Enlightenment. Look for STEPHANIE THOMAS on the Enlightenment Life List. In the future, perhaps she will be writing some comments or guest posts for us as well. STEPHANIE first took a Learning Annex class from me in Washington, D.C. around 1987. In the last couple of years she did some Energy Spirituality sessions and took some workshops here in Virginia. Any of you who attended the Pathways Whole Living Expo in 2012 and stopped by my booth may have seen her, sparkling away. Since STEPHANIE was one of my carefully selected, awesome, booth volunteers. I’m so proud of that STEPHANIE! Dr. Anita Chu recently had a session with me and voila! She has moved into that clear, maya-free, householdery version of Enlightenment… no STUFF in chakra databanks and a clearer experience than ever of the presence of God as her human identity. Congratulations, Anita! I am so, so happy to hear this news. It made my day. You’ve always been extraordinary. Now you are Enlightened-extraordinary. Here comes ADAM MCINTOSH, the latest member of our blog community to move into Enlightenment. He is #7 in that merry band. Adam will be sending a photo soon. On to acknowledging him as well on the Enlightenment Life List. Many congratulations Adam. Great news! Congratulations Adam. And Anita too! Wow! Looking forward to the photograph and future posts maybe about your experience. Thank you sending warm wishes and congratulations my way, Julie and Suzanne. Sorry for my delay in comments… I am catching up with all the excitement at the blog. In the past few months, I moved from one state to another, completed my residency training, and started fellowship training. It’s been a wonderfully exciting and hectic time! Congratulations to Anita and Adam. I always have loved Adams comments here and really am not surprised about him. He always seemed very close to enlightenment. I, too, look forward to hearing more from both of them, if they are willing to share their stories. Thanks Anita, and congratulations to you as well! Aww Jill! Thank you! That’s really sweet of you to say. I have enormously enjoyed reading everything you have written on here as well. Let us know if there are links more specific to YOU. So proud of you, ADAM. Also, now that I think about it, I’m pretty comfortable now to out myself as Max, your guest poster with the case study. That article was definitely specific to my work. At the time, I used a pseudonym because I was worried prospective patients would find the article too easily when searching for my name, and they would get put off by all the woo-woo. Now, that prospect doesn’t worry me. That, and it seems that nothing I’ve written at your blog with my name on it comes up easily on google with the kind of search terms patients tend to use. A belated thank you, ADAM. And now, a new companion on the roster of folks on the Enlightenment Life List. DAVID, a newish Blog-Buddy, got into the conversation with some comments about Enlightenment that were so insightful, I emailed him and offered to research him for the Enlightenment Life List. He joins that list now, as #180 at the Enlightenment Life List. And his blog, “In2Deep” has been added to the Blogroll at the home page here. Thanks, Rose. A unique honour. Today a new person from our community has officially moved onto the Enlightenment Life List. I’ll be putting her there officially after receiving an appropriate photo. Something nice to think about meanwhile. BIG SMILE. Couldn’t happen to a sweeter person!!!!!!!!! JOSIE PEREA is the newest addition to our Enlightenment Life List. Already an established, accomplished emotional and spiritual healer, JOSIE is currently in my Energy Spirituality Mentoring Program. 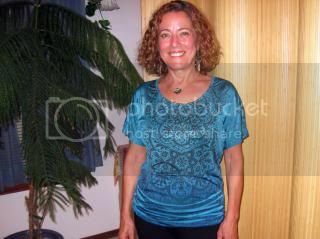 JOSIE PEREA offers sessions of Energy Spirituality in person in Las Cruces, New Mexico. In the past, she has interpreted into Spanish for me and now, as my apprentice, JOSIE has facilitated the first Energy Spirituality session entirely in Spanish. Ever. Another historic moment came to this blog courtesy of DAVID. Read about a scoop missed by the Los Angeles Times when they covered my reading chakra databanks at the Bodhi Tree Bookstore. They missed it. You won’t have to, at least after I complete today’s post and put the link here! Here is a link to the blog post about a scoop that was entirely missed by the LA Times (and to be fair, me as well) when I read the nadis in public at the Bodhi Tree Bookstore. It’s like a scoop missed by USA Today, when I read auras of the candidates in a vice-presidential debate. The scoop wasn’t so much what I wrote about Cheney and Lieberman (or how my observations were torqued out of shape by the editor of USA Today). This was, I believe, the first time anyone in a major American newspaper served as an Aura Reading Pundit, covering a major news event by researching auras of the participants. Today I’m announcing another delightful surprise for our community. “MR. ANONYMOUS,” who has also moved into Enlightenment. He is #11 from the “Deeper Perception Made Practical” community to move onto our Enlightenment Life List. How important is Enlightenment Coaching to you these days? Would you like to read articles that are directly related to moving forward on your personal path to Enlightenment? There is an active call for comments to shape priorities for blog posts. Please speak up between now and January 12, 2014. I’m a little confused about what is considered to be metaphysical studies, which I need to reduce in order to have a practical real human life. I know Law Of Attraction stuff doesn’t work, and I should not waste my time and energy on it. However, my question is more towards the stuff that you teach, e.g. Aura Reading, Face Reading, Empathy Teaching, and especially the Enlightenment Coaching, which I’m interested in. Are these considered metaphysical studies that I should limit myself studying? Thank you. MENG, that’s a fine question. A technique takes you away from reality, whether billed as a technique or something you made up on your own. Using this book does not count as Technique Time, including homework, except for the last three chapters. You can skip them. That is for the optional (wonderful) part with Skilled Empath Merge. Those three chapters would count for Technique Time. VALERIE has told me that the work she did with it was very enjoyable. But what she really loves is the aura healing work. I am very proud of VALERIE, an apprentice in the Mentoring Program in Rosetree Energy Spirituality. Blog-Buddy SANDRA HAERING has been added to the Enlightenment Life List. This post has the original announcement. Comment below, at that post, will lead you to a magnificent article that I expect to make live this week. In addition, another Blog-Buddy has become #13 from this informal online community to move onto the Enlightenment Life List. GLADYS, #13 from our community to move into Enlightenment, has a different name. Melanie Shimokawa used to have a website that was on our blogroll here. And it was mentioned earlier. So I have some happy news. Melanie changed her name, with Name Alignment Aura Reading Research. So her new name that fits her SO much better is Jessica Gates. Congratulations Jessica! Looking forward to a future guest post on your name change, if you choose to write one. JOSEFA PEREA also has a new website and yoicks! I thought I had already linked to it but not yet. So you will also find a new link to the wonderful website of this graduate of my Mentoring Program in Energy Spirituality, Rising Sun Holistic Counseling. JOSEFA is the only RES practitioner in the world (so far) who offers sessions in Spanish as well as English. She is also on my Enlightenment Life List. Another addition to the Enlightenment Life List is Larry Farwell. A householder, now experiencing the simplicity of Householder Enlightenment! He is the most famous person yet from this informal online community to move into Enlightenment. Next addition to the Enlightenment Life List is KYLIE SPARKS, the sister of Julie Blake Edison (also on that list). (4) She is very, very good at it. I’m also overjoyed to add ELAINE WARFIELD, the novelist, artist, photographer, painter, and creator of custom-made dance shoes. Another wonderful surprise of this Enlightenment kind happened on May 14, 2016. RES Practitioner JESSICA GATES was attending my Empath Empowerment Level 2 Workshop. Pretty fast this Enlightenment Coach had a hunch. Soon as I had the chance I used some of my day’s Technique Time to research her aura properly and validate that JESSICA had moved into Enlightenment. You can read more about JESSICA and Enlightenment here. Extra smart? How STUFF can hurt you.